Oftentimes, USB file sharing becomes a hassle especially between people in the same building or home are on different computers. You might tell yourself you’d rather email files but most emails can only load up to 25 megabytes. What about your presentations or audio visual productions? What if your boss wants to load it on his iPad, iPod or MacBook? I recommend you get a USB adapter like the CloudFTP USB Adapter. Honestly my first impression of the Sanho CloudFTP was something like,”Okay, just another USB adapter,” which I may have gotten from knowing that there have been other devices on the market that seem similar to it. Remember the PogoPlug and LaCie’s LaPlug? Even their color – black – was the same. Even the FTP or Fire Transfer Protocol was the same as similar devices. But Sanho—the company behind HyperJuice, an external battery and car charger for the MacBook, and HyperMac, an external hard drive for Apple devices—has designed its USB adapter to be more beneficial to Apple users so that they wouldn’t have to go through a computer to connect to USB devices. It works quite simply. The Sanho CloudFTP features a powered USB port that connects and powers any USB devices that you may have like hard drives, flash drives, card readers and digital cameras. Once it is powered on, it automatically creates its own wireless network (WiFi) to share the data inside the USB device you have inserted. In order for your boss, officemate, family, neighbors, etc. to get access to your device, they would only need to join the network from their WiFi enabled devices. They just need to have an HTML5 web app, a dedicated iOS/Android app or FTP client. On the other hand, it can also join existing wireless networks and use this to share the devices with devices on the network. 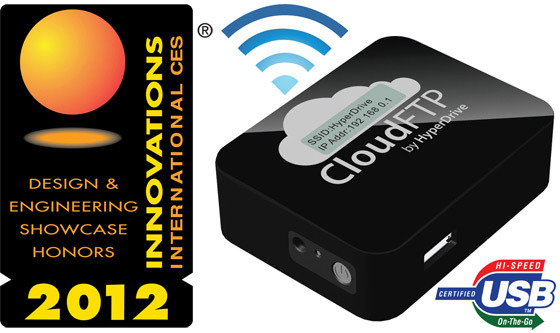 Interestingly, the CloudFTP automatically connects to the Internet and creates a wireless backup or syncs the USB data with cloud storage online like iCloud, Dropbox and box.net. Your files are now guaranteed safely and completely on cloud storage. The Sanho CloudFTP is also easy to carry being a single, compact, portable plug-and-play USB sharing and wireless cloud storage solution. The only caveat is that the company is still seeking funding via Kickstarter and if all goes well, will start the first round of mass production in January. If you pledge now, each USB adapter is priced at $69 and come January, it will be sold for $99. One promising factor to get this product up and running is that it is an International CES Innovations 2012 Design and Engineering Awards Honoree. Consequently, January will be make or break time for the CloudFTP. Thoughts? Do you think this USB device is market-worthy? This entry was posted in Android, Apple, Articles, CloudFTP, iPad, iPhone, USB Devices, USB Gadgets, Wireless USB Hub, Wireless USB Technology and tagged Cloud FTP USB Adapter, CloudFTP, Sanho CloudFTP, USB adapter, USB devices, USB file sharing, Wireless Backup. Bookmark the permalink.